New York’s Grand Central Terminal train station will celebrate its centennial in 2013. In honor of that milestone, Midtown TDR Ventures worked with Pentagram to create a new logo and identity system for the landmark location. Pentagram partner Michael Bierut oversaw the project with designer Joe Marienek. The logo includes an interpretation of the four-sided Tiffany timepiece that sits atop the information kiosk at the center of the Main Concourse. 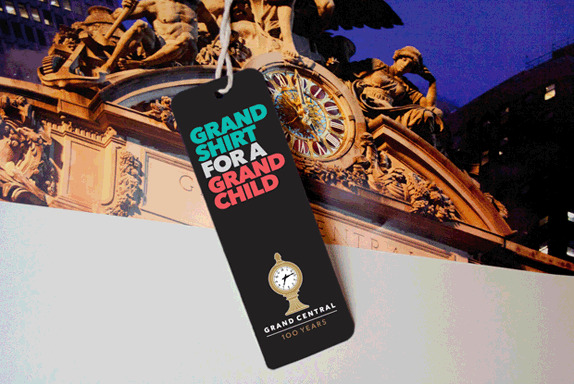 The clock is set at 7:13 PM (19:13) to represent the year that the station became officially known as Grand Central Terminal. The clock is a fitting symbol for Grand Central — a recognizable icon that recalls the interior architecture, as well as the landmark. The subtle 1913 time reference is the kind of smart, thoughtful touch that’s a signature of Pentagram’s work. Although, while this may seem a bit pedantic, the clock’s hour hand is positioned incorrectly; at 7:13 the hour hand would be almost one quarter of the distance between the 7 and 8.The wordmark is a tasteful, generously spaced use of Adrian Frutiger’s Avenir. The combination of the clock and wordmark is something less than the sum of its parts. The result lacks a venerable sophistication that Grand Central deserves. Perhaps the ornamental detail of the illustration feels a bit cartoonish. Maybe the wordmark is too understated. The result is reminiscent of logos for Las Vegas destinations like MGM Grand or Caesars Palace, or high-end shopping malls. Both of those references might be entirely appropriate given Grand Central’s popularity as a tourist and shopping destination — it’s even home to an upscale mall staple: a shiny, new Apple Store. 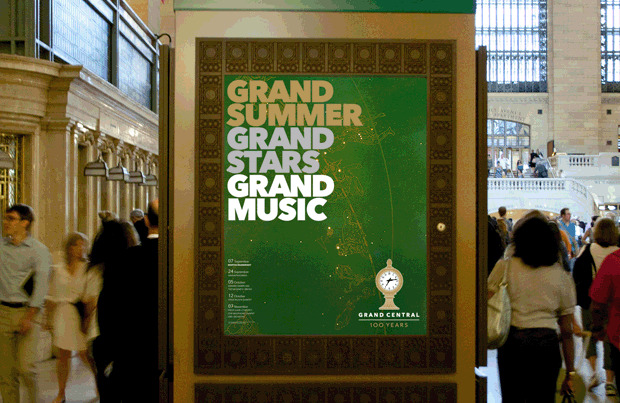 On their blog, Pentagram revealed a handful of applications for the new Grand Central identity. The ad, poster and hangtag all share bold headlines, ample negative space and tasteful logo placement. It’s an effective system — yet it presents Grand Central as more retail, less majestic, less grand. It’s another shiny coat on the identity’s commercial veneer. Bill Dawson is a mild-mannered graphic designer based in Los Angeles. 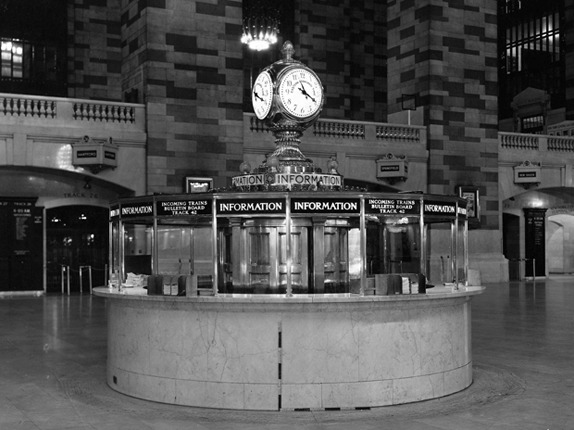 New York's Grand Central Terminal train station will celebrate its centennial in 2013. In honor of that milestone, Midtown TDR Ventures worked with Pentagram to create a new logo and identity system for the landmark location. Pentagram partner Michael Bierut oversaw the project with designer Joe Marienek. The logo includes an interpretation of the four-sided Tiffany timepiece that sits atop the information kiosk at the center of the Main Concourse. 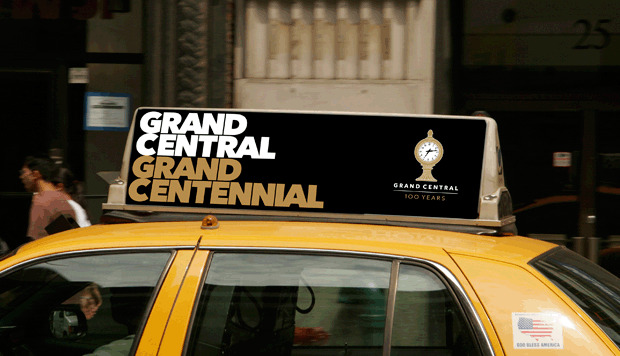 The clock is set at 7:13 PM (19:13) to represent the year that the station became officially known as Grand Central Terminal.